The Jewel platen jobber was invented in around 1881 by John M. Jones, of Palmyra, New York. It was manufactured for eight years by the second of the five companies Jones established in Palmyra between 1867 and 1901. In 1889, another of Jones’s companies, Johnson-Peerless Press Works, took over the manufacture of the Jewel, but apparently manufacture of the press was discontinued in about 1891. 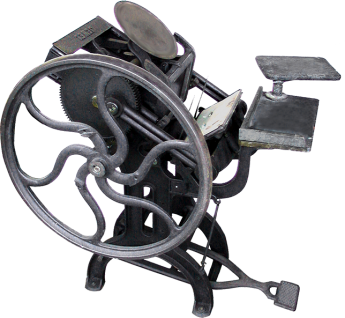 Like most of the 12 or 13 platen job presses Jones invented and manufactured, the Jewel is a relatively simple clamshell-style press. It is not known how many sizes, if more than one, were offered. Not many examples of the Jewel are known to have survived.